The following comments about attractions in Anchorage have been posted from individuals. We believe that the best reviews of Anchorage, Alaska (AK), AK USA are written by travelers and holiday makers who have experienced Anchorage first hand and want to share their thoughts. Can you share yours? Please help us expand this section of our Anchorage World Guide. 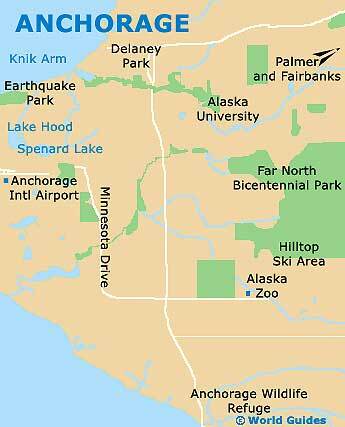 Let us know what you think about the attractions in Anchorage, Alaska (AK) USA. Submit comments about Anchorage attractions here. This is a really pretty park and I came here in the summer, when it was filled with bright flowers. It is quite small and central, so easy to find and worth a quick walk around, or a sit down. It is in between Fifth Avenue and Sixth Avenue. The Arctic Man Race takes place every year during the third week of April. This is an exciting ski race and is always watched by big crowds - and I mean big. Around 20,000 people come to this event. It is not actually in Anchorage, and is quite a journey to get there. But it is well worth it if you are here when it is on. You will need to plan ahead if you are going to stay for the night. Please note that these Anchorage, Alaska (AK), AK USA comments and reviews are posted by individuals and are not necessarily the views of World Guides.